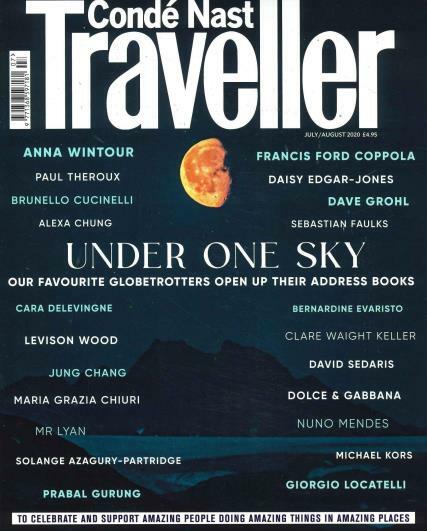 Billed as the most discerning and trusted monthly travel magazine in the UK, Condé Nast Traveller packs the expertise of some of the world’s finest travel writers into one monthly publication.Buy a single copy or subscription to Conde Nast Traveller magazine. A subscription is a must for the discerning voyager. Whether you are a safari-lover, a city-breaker or a sun-worshipper, get you the inside scoop on the world's most desirable destinations. Billed as the most discerning and trusted monthly travel magazine in the UK, Condé Nast Traveller packs the expertise of some of the world’s finest travel writers into one monthly publication. Complete with some of the best-kept industry secrets, most idyllic hidden locations and up-and-coming destinations, Condé Nast Traveller is more than just a holiday brochure. But more than that, it gets under the skin of the culture, the food, the climate and the etiquette – those important elements which make exploring the world so exciting. Finding the perfect Michelin starred restaurant, the best street food or an inviting beer garden tucked away on a side street, the writers at Condé Nast Traveller’s writers are best-placed to seek them out and report back. And it’s not just the writers who contribute. Readers are encouraged to contribute their experiences, stories and opinions on the best destinations and those nightmare breaks. And because the magazine doesn’t accept ‘freebie’ holidays you can be sure to receive an objective viewpoint and an independent authority. Excellent reviews but could broaden price range.